Specs: Philippine eagles, crocodile, nature parks, tourist spots, buffet, food, zipline, native goods, fruits, shopping.
. This itinerary covers the basic Davao City tourist spots perfect for first time visitors.
. Weekend travelers can combine this with a one day Samal Island itinerary (coming soon).
. Arrange a whole day rate with a taxicab. Give your itinerary to the driver so he can give you his best rate. Taxi rates here are cheaper than in Manila or Cebu.
. Probinsya restaurant’s breakfast buffet costs about P200.
. Philippine Eagle Center entrance fee is P80.
. Malagos Garden Resort entrance fee is P100.
. People’s Park entrance fee is P70. Grab your lunch from the many food stands in People’s Park.
. Shop for dry goods in Aldevinco Shopping Center and then hop on to the Madrazo fruit stands for a taste of Durian.
. If you are staying in the city, It’s a good time to check-in at your booked hotel in Davao City now (around 1300-1400) so you can also drop off your pasalubong purchases.
. The Outland Adventure zipline rate is P300 per person.
. Take a merienda breather at Riverside restaurant beside the Crocodile farm to taste Croc meat.
. The Crocodile Farm has performances every Fri-Sun around 4:30pm. Entrance fee is P100.
. On your way to Jack’s ridge, instruct the cab driver to cruise by the City Hall, Bonifacio Rotunda, Quezon Park, San Pedro Cathedral, Rizal Park. If you have extra time, you can get off the taxi for some pictures.
. In Jack’s Ridge, you can order your food first and then explore the area before coming back to your table. This area is popular for its wonderful view of Davao City at night.
. Depending on your taste, there’s a wide selection of night life activities in Davao City. Some of the bars you can check out are: Torres St bars., Durian Bar, Jack’s Ridge and The Venue. .All major domestic airlines fly to Davao City at least once a day. These are Philippine Airlines, Cebu Pacific, Zest Air, Sea Air, Airphil Express. .The flight schedules sampled here may change in time. Check the respective airline websites to see the latest flight schedules and adjust the itinerary if necessary.
. Similar to Cebu, there are numerous buffet places in Davao.You can have breakfast somewhere else if you know a better place or if you are on a budget.
. Pre-arrange hotel reservations if you plan to spend the night in the city.
. You may also spend the night at the beach in Samal Island (itinerary coming soon).
. Make sure the pasalubongs, particularly the Durian fruits you buy are allowed in your hotel.
. If your knees are shaky at the thought of riding the zipline, head on to the GAP farm instead.
. You can also try other popular food places in Davao such as Colasa’s or Dencio’s Hilltop for dinner. Two thumbs up for your blog ! You provide nice and updated about Philippines and Manila ! I read some of your articles carefully and your content can be really useful for my readers looking for travel, tips and activities in Manila ! Thanks for your comment, I will drop you a message. We are planning to visit the GAP farm this summer. We may ask if how much is the entrance fee and other fees. Thank you. There's a P50 entrance fee to geet into the GAP farm. I recommend a visit to Samal Island on day 2: check out Pearl Farm and beaches in Talicud Island. For day 3, you can do your own thing - visit more city spots, try out civet coffee in local coffee shops! Hi! 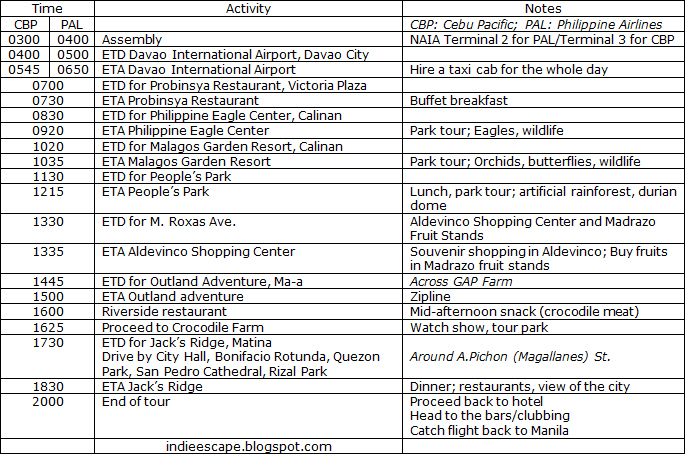 I'm planning to visit Davao with my parents on May 2~4. I'd like to go around Davao City on day 1 and proceed to Samal on day 2. I'd like to ask if is it more convenient to book accommodation around Davao City or in one of the resorts in Samal? I checked Pearl Farm, unfortunately they are fully-booked. thanks. If you have the budget for Samal, then by all means go ahead! Be minded though that Samal island has different 'areas' like Paradise Island (cheap) and Pearl Farm (expensive). I'm not sure when the last trip to Samal Island is, but I was able to catch a ferry around 7PM once.